Johnson's New York and Brooklyn. This is A. J. Johnson's attractive vertical plan of New York City. It depicts all of Manhattan, Brooklyn as it was at the time and parts of Queens, Long Island City, Astoria, Jersey City and Hoboken. It covers Brooklyn from Greenwood Cemetery in the south northward to include Prospect Park, Bedford, Williamsburg and Greenpoint and extends eastward as far as Evergreen Cemetery. Detailed to the street level throughout showing individual piers, buildings and railroads. Shows many of the public buildings on Blackwell's Island (Roosevelt Island) including the decrepit Civil War Hospital that still stands at the southern end of the Island. Both Central Park and Prospect Park are shown in stupendous detail according to the Olmstead Plans. Notes ferry crossings between Manhattan, Brooklyn and New Jersey. An inset of the northern portion of New York is included in the top right quadrant. 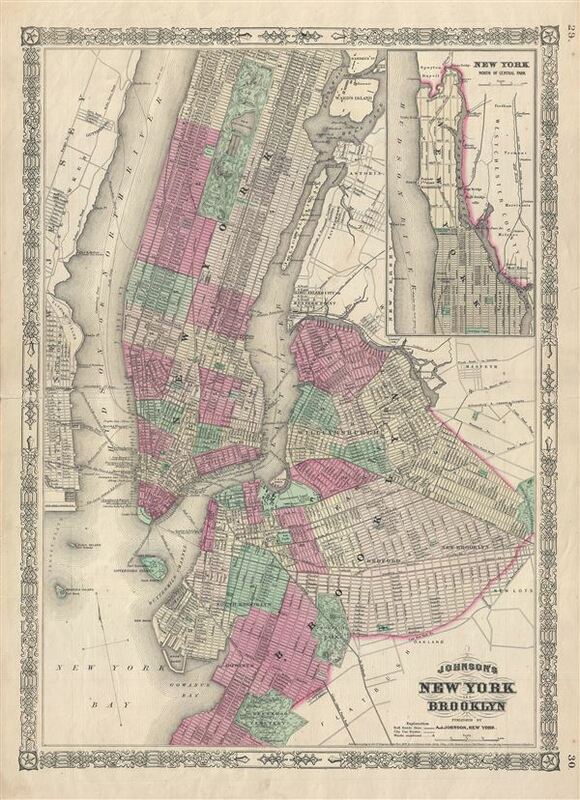 Johnson's original plan of New York, introduced in the 1862 edition of his atlas, was oriented from east to west. In 1866 Johnson re-engraved his New York City map giving it a rough north-south orientation. His goal in doing so was to accommodate interest in the Upper East and Upper West Sides, both of which, following the completion of Central Park, were rapidly developing. The map features the fretwork style border common to Johnson's atlas work from 1863 to 1869. This map was published by A. J. Johnson as plate nos. 29 and 30 in the 1866 edition of his New Illustrated Family Atlas of the World. Very good. Some wear and verso repair along original centerfold. Minor spotting at places.